Cold finished steel bars are an entire family of products that meet the standards in ASTM A108. Corey makes the product using numerous processes to meet the attributes of an engineered bar product and particular needs of our customers. 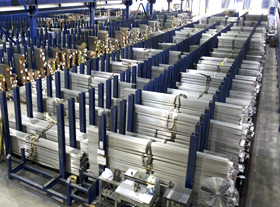 Corey has been manufacturing cold finished steel bars for almost six decades. Beginning with a single drawing line, we now have one of the most modern facilities with coil fed continuous drawing lines capable of drawing bars from just over a quarter inch to 2 inches in diameter. We also operate draw benches that can make round bars up to 4 inches, hexagon bars to 3 inches, and squares to 2 inches in diameter.A cold drawn bar is produced by drawing a hot rolled bar through a die without heating the material, then shearing it to a desired length and straightening it to commercial tolerances. The resulting product meets exacting tolerances for concentricity, diameter, straightness, length, and surface finish. These tolerances vary depending on the size and chemistry of the material ordered. ASTM A108 sets tolerances and guidelines for different sizes and grades of the product. Corey can test bars magnetically for surface defects. 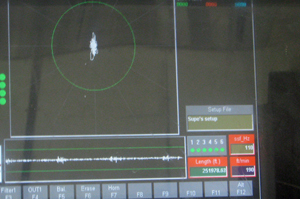 Commonly called eddy current testing, this test looks for surface defects at a prescribed depth by creating a magnetic field which is broken and measurable by surface defects. Corey can perform this test both during the drawing process and offline if needed. While cold drawing is the most widely used method of making cold finished steel bars, the same or better attributes can be achieved by turning or grinding the material. The turning process can begin with either a hot rolled or cold drawn bar while a ground bar uses a cold drawn bar as feed stock. Depending upon the application of the finished product, many different combinations of diameter tolerances can be achieved. Corey has not forgotten that its roots come from the distribution end of the steel products business. We believe that maintaining a sizable amount of inventory of cold drawn bars gives our company the flexibility to balance the production side of our business with our customers’ requirements. Our inventory holds the sizes and grades that support our current sales and our sophisticated inventory optimization program changes that profile as our customers and their requirements change. 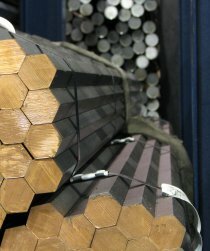 PLEASE CLICK ON THE LINKS BELOW TO VIEW SIZES, GRADES, TYPES AND TOLERANCES OF STEEL WE CARRY. Rounds – Cold Drawn or Turned and Polished Max Carbon Range 0.28% or less Max Carbon Range 0.28% to 0.55% incl. Max Carbon Range 0.28% or less Max Carbon Range 0.28% to 0.55% incl. Hexagons – Cold Drawn Max Carbon Range 0.28% or less Max Carbon Range 0.28% to 0.55% incl. Max Carbon Range 0.28% or less Max Carbon Range 0.28% to 0.55% incl. Squares – Cold Drawn Max Carbon Range 0.28% or less Max Carbon Range 0.28% to 0.55% incl. Max Carbon Range 0.28% or less Max Carbon Range 0.28% to 0.55% incl. All tolerances are in inches (Millimeters) and are all Minus. This table includes tolerances for bars that have not been Annealed or that have been Annealed, Spheroidized Annealed, Normalized, Normalized and Tempered or Quench and Tempered (Heat Treated) before Cold Finishing. This table does not include tolerances for bars that are Normalized, Normalized and Tempered, or Quenched and Tempered after Cold Finishing.